Grab your chance to be named as the International Photographer of the year, 2016 by submitting your entries on or before December 11th, 2016. 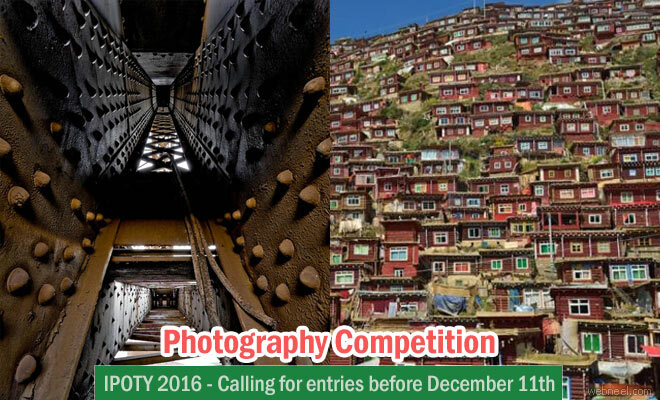 IPOTY 2016 is a annual event which is open to amateurs and professionals. According to IPOTY 2016, "IPOTY creates new opportunities to showcase the best photographic work and introduce leading talents to the world of contemporary photography. We celebrate creativity, ambition and support artists to develop and present their work through competition". Submit your entries and get ready to win a pool prize of $4000. If you are a professional photographer, you can submit under these categories: Architecture(bridges, buildings, cityscapes, industrial, interior), Fine Art(abstract, conceptual, landscapes, nudes, photo-manipulation), Editorial(daily life, documentary, environmental, photo story, sports), Nature(Aerial, landscapes, wildlife, seascapes, trees). People(Children, Portrait, Travel, Fashion, Street). If you are an amateur photographer you can submit under these categories: Architecture(bridges, buildings, cityscapes, industrial, interior), Nature(Aerial, landscapes, wildlife, seascapes, trees), Fine Art(abstract, conceptual, landscapes, nudes, photo manipulation), People(Children, Portrait, Travel, Fashion, Street), Open Category(Night Photography, Photojournalism, self-portrait, open theme, long exposure). Winners will receive a Gold, Silver and bronze seals in each category.